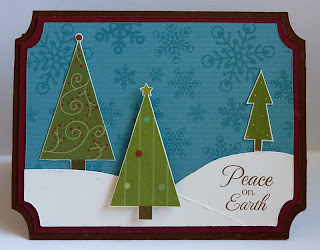 This is my 2nd post today, please click here to see my post for the My Creative Time 12 Days of Christmas! Welcome to the Monday Hop with EAD Designs! I'm so excited to be a guest designer this month! Thanks, Liz, for inviting me! You should have arrived here from the talented Stephanie! If you just popped on over to see me, then you should head over to EAD's blog to begin. You don't want to miss a thing today! Be sure to leave a comment at each stop to be eligible to win a prize! To create my ticket shaped card today, I took the ticket from the Cricut Art Philosophy cartridge and used my Gypsy to size it at 4 1/4" x 5 1/2" real dial size. I welded two of these together at the top to create my card base. The scarlet layer is sized at 4" x 5 1/4", and the blue patterned layer is cut at 3 3/4" x 5" (both real dial size). I cut that last one again in white and used that to cut some snow to fit right on top of the ticket shape. I distressed all of the edges before adhering them down. Now for the fun part! I can't tell you how excited I was to receive my EAD Designs goodies in the mail! I have never used stickers on my cards before, and they are so much fun! They just take me back to those days when I was younger and collecting stickers, although these are much nicer, made out of vinyl! The trees I used on my card are from the Sweet Sweet Christmas Stickerz collection. These can be ordered on clear or white vinyl. Since mine are on clear vinyl, and I wanted them to show up on my background, I adhered them to some white cardstock and trimmed around them. This also allowed me to pop up the center tree with some dimensionals. 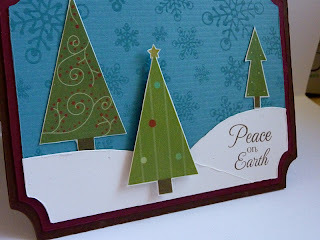 The "Peace on Earth" sentiment is from My Creative Time's All Around Christmas stamp set. Your next stop is the fabulous Jenn! So beautiful,Katie! I love the "clean" look of it!! This is really adorable. Gotta try that. Very pretty card. I love the colors and the scene. Great job. Beautiful card! Love the simplicity! sooo beautiful! wonderful job on this card! this card is lovely! love it and I will try it! thanks for sharing! Very Very cute card Katie. Love this trees. Thanks for share with us. so pretty your card looks great. love the snowflakes, great scene. arent the vinyl stickers lovely? darling!!! the ticket shape adds the perfect detail! This card is so clean looking! Super cute, yet simple. Really beautiful! I love the colors as well. Great job! P.S. Your blog is beautiful too! What a nice, traditional card. Love it. How sweet---I like the simplicity. So cute! And very simple! Love it. Such a beautiful card nice clean and crisp! Such a pretty card! I love it. I never would have guessed that those trees were stickers. I love the simplicity of the card. This card is a perfect example of how lovely clean and simple lines can be. i really like this card. it reminds me of the old days. So serene! I love the shape you made the card into and all the colors! TFS! The card is beautiful, I love the trees. Beautiful card. I love it!!! This is simple, but lovely! !